&#160;&#160; &#160;On November 16, 2013, at 4:40 am, Wetaskiwin RCMP received a report of a break and enter to the Mickey and Minies Liquor Store, located in Millet, AB.&#160;&#160; &#160;Upon arrival, Police observed considerable damage to the front window of the store. Further investigation determined that a male suspect backed a tan colored Pontiac Montana Van through the front of the store, causing the damage. A second suspect male entered the store and a quantity of liquor was subsequently taken. &#160;&#160; &#160;There is no other description available of the suspect driver of the van. The second suspect was wearing a grey colored sweatshirt and blue jeans with a black toque. &#160;&#160; &#160;Anyone with information regarding this incident is asked to call the Wetaskiwin RCMP detachment at 780-312-7200 or Crime Stoppers at 1-800-222-TIPS (8477). Crime Stoppers does not require you to reveal your identity. Further, if your tip leads to an arrest, you may qualify for a cash reward. &#160;&#160; &#160;On November 13, 2013, Wetaskiwin RCMP arrested three male youths in relation to the brake and enters to the rural residence in Ma-Me-O Beach, located west of Wetaskiwin, AB. &#160;&#160; &#160;The three youth, who are between the ages of 13 and 16 years, have been charged with two counts of brake and enter, contrary to section 348 of the criminal code. &#160;&#160; &#160;The three youths are scheduled to make their first court appearance in Wetaskiwin, AB, on December 4, 2013. As pr the Youth Criminal Justice Act, the three youths cannot be named. &#160;&#160; &#160;On November 8th, 2013, shortly after midnight, a male victim attended the Wetaskiwin RCMP detachment to report that he had been robbed at knife point by an unknown female suspect. It is alleged that the victim met a female through social media and made arrangements to meet her in Wetaskiwin, AS. &#160;&#160; &#160;Once the victim arrived in Wetaskiwin, he tried to meet with the female: however, a friend of the female met with him instead and demanded he hand over his money and his cell phone. During this incident, the suspect female was allegedly holding a knife and a can of bear spray. &#160;&#160; &#160;Patrols around Wetaskiwin resulted in police locating a suspicious vehicle. Police checks on the vehicle indicated it was stolen out of Edmonton. AS. Upon engaging the vehicle. RCMP obseNed that the two females inside matched the description of the suspect females, and they were subsequently arrested. The victim&#39;s cell phone and money were recovered from inside the vehicle. as well as, a knife and a can of bear spray. &#160;&#160; &#160;25 year old Karie Lynn JAMERSON and 24 year old Randi Joanne OLSON, both from Edmonton, AS have been charged. – one count of Robbery with an offensive weapon contrary to Section 344(b) C.C. – one count of Possession of property obtained by crime over $5000 contrary to Section 355(a) e.e. – one count of Possession of property obtained by crime under $5000 contrary to Section 355(b) CC. &#160;&#160; &#160;Both were brought before a Justice of the Peace and have been remanded in police custody. They are scheduled to make their first court appearance on November 19&#39;h, 2013 in Welaskiwin, AB. &#160;&#160; &#160;On November 8th, 2013, at approximately 3:25 p.m., The Leduc RCMP were dispatched to assist the Local Fire Department with a fire at the Wal-Mart store in the Leduc common area. &#160;RCMP, Fire and EMS attended and insured the fire was extinguished and that the area was confirmed safe. During the course of the investigation, RCMP learned that the fire had started in the sporting goods section and was contained to a small area. &#160;Witnesses noted seeing 2 teenagers in that area of the store just before the fire started.. &#160;The first was a Caucasian male, wearing a darker colored winter coat (possibly black), dark colored pants and carrying a back-pack. The second was a slender Caucasian male, approximately 5&#8217;6&#8221; to 5&#8217; 8&#8221; tall with brown hair, wearing a black ball cap, a short navy blue jacket and blue jeans.At this time, the RCMP is still investigating this incident and would like to ask the public to notify them if you have information about this fire, or the identification of the 2 suspects.Please contact your local RCMP Detachment at 780-980-7200, or if you want to remain anonymous, you can contact Crime Stoppers by phone at1.800.222.8477 (TIPS), by internet at www.tipsubmit.com, or by SMS [www.crimestoppers.ab.ca]. &#160;You do not have to reveal your identity to Crime Stoppers, and if you provide information to Crime Stoppers that leads to an arrest(s), the recovery of stolen property, and/or a seizure of illicit drugs, you may be eligible for a cash reward. &#160;&#160; &#160;On November 4th, 2013, at approximately 10:13 p.m., The Leduc RCMP received a complaint of an armed robbery on 50 Avenue at Mico&#8217;s Liquor Store in Leduc Alberta. &#160;Leduc RCMP immediately responded to the call but were unable to locate the two suspects who fled the store on foot.Witnesses and surveillance video footage helped RCMP in getting a better description of the suspects. &#160;The first suspect was described as 5&#8217; 11&#8221;to 6&#8217; tall, 175 to 190 lbs. and was wearing a black leather jacket (Similar to a Letterman football jacket) and blue jeans with short dark hair. &#160;The second man was said to be 6&#8217; to 6&#8217; 2&#8221; tall and approximately175 to 190 lbs. wearing a similar jacket to the first suspect. &#160;Both men were wearing a bandana over their nose, ears and mouth and one was carrying a long gun, possibly a German Lugar or similar weapon. &#160; &#160;&#160; &#160;At this time, the RCMP is still investigating this incident and would like to ask the public to notify them if you have information about this robbery, and NOT to confront the suspects as they may be armed and dangerous. 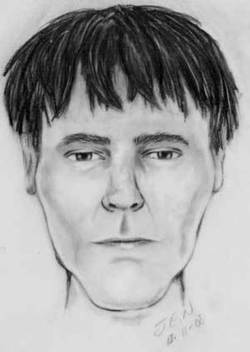 &#160;RCMP confirmed that no one was injured during this incident.Composite drawings of the suspects have been completed by an RCMP sketch artist from witness descriptions. seizure of illicit drugs, you may be eligible for a cash reward.